You�re viewing our Sausage Maker smoked poultry jerky seasoning � makes 25 lbs. 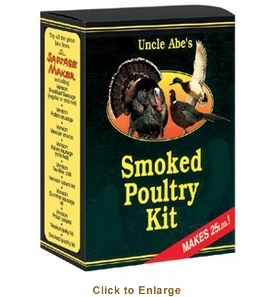 Uncle Abe's seasoning gives a delicious, smoky flavor to poultry. Use this smoky seasoning on homemade jerky, or use it to season up sausages, chicken, meat patties and more. Directions for use is on each package. Includes Insta Cure� No. 1 (2 oz. 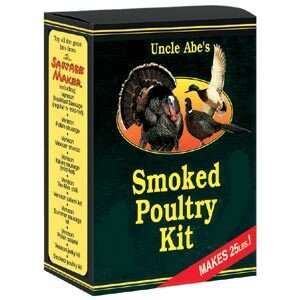 per kit), hickory liquid smoke and poultry brine seasoning. Makes up to 25 lbs. of flavorful jerky. If you have questions about our products we are here to help you.